Welcome to my 50th airline trip report part 1! Writing about everything I can think of. So sit back, relax and enjoy my report! After completing my last sector with Starflyer (my 49th carrier), I started short-listing the airlines that would be my 50th carrier. Since the number, 50th, is special, I am hoping to make this a special trip. The airlines that came into my mind were TAM, American Airlines, China Airlines, Hong Kong Airlines and Dragon Air! When Royal Brunei Airlines announced the Dreamliner flights to Singapore and Kuala Lumpur, my mind was all set to fly with this airline in November. The inaugural date was on the 18th of October (Brunei to Singapore) and a one-time flight for Brunei to Kuala Lumpur was on a day after. I wanted to go for the inaugural but the price was too high and also I didn't have the time. So never mind about missing out on the inaugural flight, getting a good price and choosing the right date was the priority. Once I selected my date (1st of November), I made my booking and waited for the date to come! I paid around $180 for the return ticket, much cheaper than flying out of Singapore which cost around $450 at that point of time! The website has to be one of the disappointing aspects about the BI's experience. The website is pretty much basic, doesn't allow you to select your seats, make changes to your itinerary or has its own 'manage its booking function - it relys on the 'Check my trip' application to view it. The airline certainly could do some upgrading over it to keep on par with its competitors. On the bright side, at least it was working without any problems. I think we can all agree that's the most important thing. If you want to make changes, you have either the option of going down to the office or giving them a call. 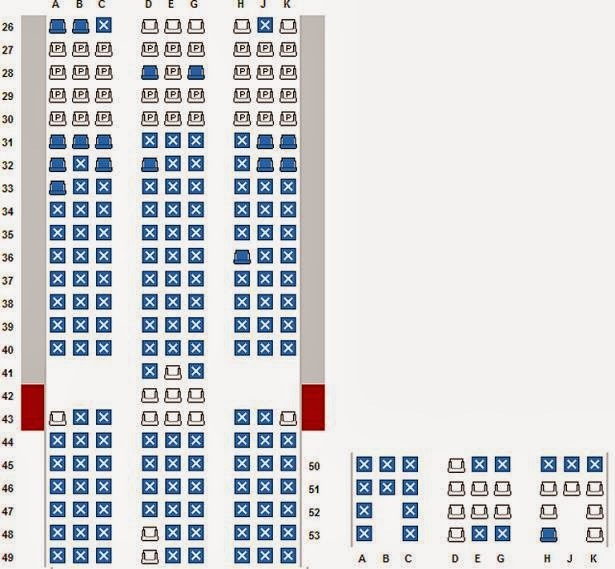 However, thanks to expertflyer.com, I was able to see the seat map. As you can see the original date, 1st of November was operated by Boeing 787. I wanted both ways to be Boeing 787 to make it worth while. Just 2 weeks before the date of departure, I received a private message by Initious(Daniel) that the 787 was not flying on this date and the 787 would not be flying to KUL daily. I did some checking on the website and I knew that I had to make the change sooner or later. I decided to wait for a few days to see whether the 787 would be swap back. After that, I decided to pay the office a visit. The Royal Brunei Airlines Office is located at UE Square Shopping mall, #03-13. The nice staff told me that I could change the dates but I had to pay a fee of S$70 for it. Took a few days to think it though and I decided to give it a go ahead. I was just afraid that the equipment may be changed again. Even after paying the $70, I still feel that the air ticket price was a good deal. Once this was all settled, I confirmed the rest of my booking. Beautiful isn't she? I like the livery even more now! I will do trip reports on Malaysia Airlines, Singapore Airlines and Malindo. My flights on Jetstar and Air Asia were routine and since I had done it before, I would give both airlines (trip reports) a miss this time round. On the day itself, I left the apartment at Bukit Bintang, took the mediocre monorail to KL Sentral. From there, I paid the return KLIA Express train to the airport. Each way cost 35RM and the return cost 70RM. The train takes around 28 minutes from the train station to the airport. Fast and efficient! However, the free wifi network wasn't working well so I had to settle with my 3G. Reached the airport about 3 hours before departure, I went walking around the land side for some exploring and then settled down for a small meal at Old town cafe. 4 airlines use the KLIA city check-in and that is quite convenient. The 4 airlines are Malaysia Airlines, Cathay Pacific, Royal Brunei and Emirates. I did my check-in over here and then made my way to the air-side. Aviation enthusiasts' biggest fear is for our desired aircraft to change. It was only until I saw this photo below and the fear was gone. Thanks to flightradar24, I was able to know which aircraft I was flying on, very useful especially when you are at the foreign country. I decided to wait for its arrival by going to one of the plane spotting spots at the Satallite terminal. Plane models anyone? Its funny to see Air Asia's A320 bigger than the Boeing 777! Looks similar to Singapore's version. There she is, the beautiful Royal Brunei's latest flagshop - the Boeing 787 Dreamliner! Spotting a Garuda's Boeing 737-800 taxing in. Did a bit of spotting and after getting what I wanted, off to the gate! I was not the only exciting soul around. There were a number of other passengers seen taking photos of the beauty! V8-DLB on this day was doing its 4th day of duty, that was how new the aircraft was. It was delivered on the 1st November. Soon, boarding commerced and I made my way down the aerobridge and entered my 3rd Dreamliner! 3rd time on a 787 Dreamliner, first time on this aircraft. The 787 Dreamliner experience has begun! The excitement of boarding the aircraft grew bigger. Once on board, I entered the cabin and walked through the aisle to my seat, along the way, I was greatly impressed with both the interior and the warm welcome from the crew. One particular crew was extremely friendly towards me; I should have gotten his name and sent in a compliment letter to the airline. The new smell was quite obvious and everything on board was what you expect it to be. This was my first time on a 3-3-3 configured 787 and personally I prefer the 2-4-2 but of course airlines need to make money so naturally they have to do what's best for themselves. What makes up for the extra seat in the row is the leg room space and the comfortable seat cushion. At a reclining mode, I found it to be sufficiently comfortable to have a few hours of nap. Cabin crew were waiting for more passengers to board. Cabin shots of the Y class cabin. I like the colours of the seats, very smoothing for my eyes. For a 192cm/6-foot 4 person like myself, I find the legroom space to be adequate and if the flight is full, I would pick the aisle seat and that would be fine for me for long haul. I think the airline has done a good job with the Economy class seats. 2 windows for me to play with. No smoking sign on the seat. Seat pitch is 34 inch, so its absolutely fine for me. The tray table is fixed and there is no way to bring it closer to the passenger. and I feel that there should a drink holder somewhere. It takes about 90 seconds to change from the brightest to the dimmest and vice versa. This is to open the overhead bin compartment, and there is a lock there to prevent anyone opening it. Buckle up, ladies and gentlemen! The window shade control. Do take note that the cabin crew can control the windows during the flight. Useful information of the location of the life vest and to buckle up at all times! The Boeing 787 Dreamliner has definitely lived up to its name. After flying on one, I want to fly more on this aircraft type. Despite its problems, like I have mentioned in my earlier trip report, its a joy to fly on this beauty. There are quite a fair bit of difference between this aircraft and the older generation. Overall, you will find this plane an upgrade over others. The aircraft pushed back late due to the late arrival of the aircraft. The Captain did apologize for the late departure but he didn't mention the reason why, but I think it could be some minor problem with the aircraft. That didn't matter to us anyway, as long as we were on it that mattered. The Rolls Royce Trent 1000 engines were started, the noise isn't as thrilling to hear compared to the GE90-110/115B engines but it is still loud. Before we left our gate, there was a video on a prayer before every flight and then a manual safety demo done by the crew. We then taxied to the runway 32R for departure, and it took about 15 minutes. The pilot promised us that he would make up the time loss but for this case I hope not! Then the take off came, it was a noisy but powerful take-off. My aviation friends mentioned to me that the 787 wasn't exactly quiet definitely not comparing to the A380 and I have to agree. Some window-shots photos. Please enjoy! Started our descend towards Brunei, it was my first time heading there. The weather wasn't very good as there was quite a fair bit of bumps throughout the flight. However, that didn't spoil my mood and a few other spotters I saw after the flight. I found out later that these couple were from Malaysian Wings, they were also on board to fly the 787 and were also return back to KL on the same day as us. Apparently they were originally supposed to fly on the 19th November which was the inaugural flight for the BWN-KUL route, but because the aircraft, V8-DLA went technical for a few hours, they changed their ticket to this day. Always nice to have the usb port for charging your mobile phones or other entertainment purposes. Let's have a look at the entertainment system. This system is touch-screen and it doesn't come with a remote controller. I tried the system, its quite responsive when clicking on the icon, no major issues at all. However, the features in it is limited and of course can't be compared to the likes of KrisWorld or Emirates's IFE system. USB port is very useful for charging your electronic devices. There is even something for the kids. At least its up to date with the majority of the airlines that are using this system. Its easy to use and has most of the in-flight information. What is lacking is the camera view, it seems the airline didn't install any on this aircraft, guess it has its own reason for excluding this feature. The IFE system also offers a Gate-to-Gate function which means you can use it before take-off and after landing. Do take note that since there is no remote control, the buttons that are normally found on the remote control to switch on the reading light and crew-service call, are just below the PTV screen. I did a test whether there is WiFi on board and this was the result, I suppose the WiFi is for pilots and the engineer to use just in case if they encounter any problems with the aircraft. After exploring the IFE system, it was time to eat. My friend had the seafood and I had the Chicken. Both meals satisfied our taste bud and we finished it in no time. Do take note that this airline doesn't serve Alcohol. The 787 Dreamliner toilet is an improvement over the older aircraft models. The airline should have instructions on how to operate the door. ANA has it, here is the photo. I find opening the door of the toilet (from the inside) quite difficult. Its better to have instruction on it. A cockpit visit, thanks to the wonderful crew! Some photos of the cockpit. This is one of the plane-spotters from Malaysia wings. My favourite seat, I wish I can make this mine permanently! The HUD display allows the pilot-in-command to view the essential flight information while flying the aircraft. A big thank you to the flight crew for allowing me inside the cockpit, sharing their knowledge and of course taking photos in it. Its nice that some of these pilots are very welcoming to aviation enthusiasts and I hope I get more opportunities like this on my future flights. We bid goodbye to V8-DLB, not knowing later that she would be taking us back to KUL. Thumb up to Royal Brunei's 787 Dreamliner. This flight consisted of more crew than usual. There were at least 20 over cabin crew, some of them were sitting at the rear during the flight. Quite obvious that these temporary short haul flights were to train the flight and cabin crew, giving them more hours on this new type. The more flights they fly on, the more experience they are. Some of them especially some of the female crew were pretty reserved. However, they were professional and polite through out the flight. I had a chat with a couple of them and they were happy working on the aircraft especially the 2 in very front part of the aircraft. I feel that some of the crew should open up more when they serve the passengers, smile a bit and say a few words or two, that would make the passengers especially the younger ones feel much at home. The in-flight supervisor was superb, he was the main reason we got the cockpit visit and allowed us to take photos of the Y and J class cabins, a big thank you to him! It was a great flight with Royal Brunei. Trying out the new aircraft and in-flight products made this 50th airline flight an even special one. I am absolutely grateful to the cabin and flight crew for making this enjoyable for all of us especially to the aviation enthusiasts. The new economy class product has certainly impressed me. Even though its in a tight 3-3-3 seating configuration, passengers can be assured of flying in comfort on long haul routes. Flying with this airline on long haul routes (Example: Australia to Europe) on the Boeing 787 Dreamliner is definitely recommended by me. With a fleet of 5 787 Dreamliners in total, the number may increase in the near future. As the airline is looking not just to replace the Boeing 777, at this time, its also looking to replace the A320s. Fleet renewal is important to keep itself competitive against the fiercest rivals around the region. I am looking forward to seeing this airline expand and make its presence felt in more places (better network). Check out my part 2! A very complete TR. Well written and nice photos! Loved these photos, they are so amazing. It feels really amazing when you feel yourself into the clouds.